Black pepper cookies or wine cookie had originated south of Rome in an area called Ciociaria. These wine cookies have a long history of being passed down through generations Ciociaria had annual food fairs that would showcase them there. They would celebrate patron saints with music and feast. 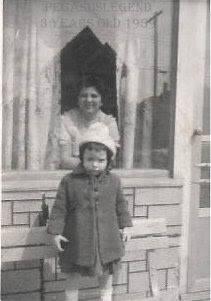 My grandma Victoria Ferraro Colenzo was born in from Rome, Italy. My mom's side of the family, all came from Bari, Italy. They both carried on a traditional wine cookie that we called black pepper cookies. The basics of the recipe below is a little cookie made with white wine, no sugar and is like a peppery bread stick. My mom kept them around all the time. I love to make a double batch, they freeze well and don't tell anyone but they taste great right from the freezer! Bake at 400 degree preheated oven, until lightly browned. I am making these right now! The smell awesome! Thanks @SteveBerke my brother and sisterinlaw live in Stuart will come visit some time! sounds like my kind of stomping grounds .. thanks for the kind words Cheers!